KFC, apparently, is not to be outdone by its sister chain, Taco Bell. Just days after T-Bell unleashed its monstrous Naked Chicken Chalupa nationwide, KFC announced it too has created an abominable new stunt food out of fried chicken: a pizza. Really. Fried chicken is, of course, delicious. And pizza should be its own damn food group at this point. But combining the two foods is madness and, well, it admittedly sounds delicious. It's called Chizza, and basically, it’s a piece of boneless fried chicken that comes topped with ham, pineapple, mozzarella cheese sauce, and pizza sauce. That’s right: the fried chicken is the crust and we’re not even mad about it. 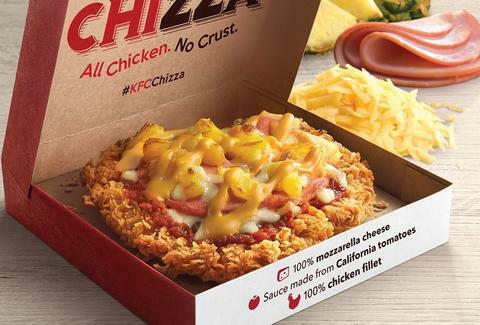 Unfortunately, it looks like this crime against pizza is only available in Singapore right now, although KFC has previously launched it in the Philippines, Taiwan, Thailand, India, and Japan, according to a report by Asia One. Oh, and don’t forget the similarly insane “Napoli Crispy Pizza Chicken” the chain unleashed in Hong Kong back in 2015. We reached out to KFC to see if there are any plans to launch a similar menu item in the United States. But maybe it’s best if that doesn’t happen. UPDATE: A Yum! Brands spokesperson said there are currently no plans to bring the Chizza to the US. Tony Merevick is Cities News Editor at Thrillist and would probably eat this. Send news tips to news@thrillist.com and follow him on Twitter @tonymerevick.